Shavuot—one of three biblical pilgrimage festivals—is itself a two-fold holiday: While we celebrate God’s giving of the Torah to Moses, we also honor the wonders of cooking, especially baking, with real dairy ingredients. Cheesecake and blintzes have long been de rigueur for Shavuot, but how about branching out this year? Stanley Ginsberg and Norman Berg’s popular cookbook Inside the Jewish Bakery: Recipes and Memories from the Golden Age of Jewish Baking (Camino Books) provides a delicious starting point for holiday inspiration. I suggest trying their dairy rugelach—using either a sour cream or cream cheese dough—in a variety of flavors from chocolate to raspberry to apricot. Ginsberg and Berg’s baking bible is an indispensable introduction to the classics of the kosher bakery case (think elephant ears, babkas and strudels), so their guidance will be invaluable as you make your way through rolling the dough and wrapping up the filling. Hag sameah and b’teyavon! 1. Preheat oven to 350 degrees. Remove dough from refrigerator and break it by hand or machine. Place it on a lightly floured work surface and roll into an 18×8-inch rectangle, 1/8- to 1/4-inch thick. Dust with flour as necessary to prevent sticking. 2. Brush the dough with half the melted butter and spread the filling evenly. If using cinnamon sugar, sprinkle with chopped nuts and/or raisins if desired. Use the rolling pin to press the filling gently into the dough. If using jam, combine it with the cake crumbs before spreading. 3. Using a sharp knife or pizza wheel, divide the dough lengthwise into two strips about 4 inches wide and then make a series of diagonal cuts to form two rows of triangles about 3-inches wide at the base. 4. Starting at the short end, roll each triangle jelly-roll style so that you have a tapered cookie with the point in the middle. Place them point side down on parchment-lined sheet pans about 1 inch apart. 5. 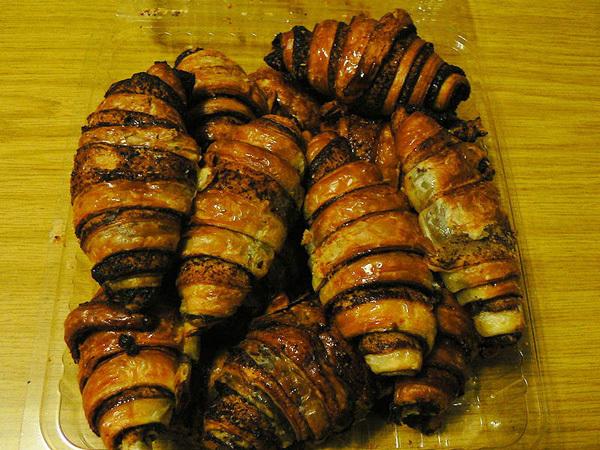 Wash with egg, if desired, and bake for 15 minutes, until rugelach are light brown. Arrange on a rack, brush with remaining melted butter and let cool. 2. Turn the dough out onto a well-floured work surface and form into a flattened disk about 5 inches in diameter. Wrap in plastic and refrigerate overnight. 1. In a mixing bowl, combine the cream cheese, butter, salt and use the flat paddle beater at medium-low speed to blend until uniform, 2 to 3 minutes. 2. Reduce the mixer to low speed and gradually add the flour, mixing only until a soft, sticky dough is formed, 2 to 3 minutes. Form the dough into a ball, wrap in plastic and refrigerate for 2 to 3 hours to chill. 3. Place the chilled dough onto a lightly floured work surface and roll it out into a sheet about 16×10 inches. Carefully fold into thirds, brushing away any excess flour. Scrap the work surface clean to remove any dough sticking to it and lightly reflour. 4. Turn the dough upside down so that the bottom is now facing up and rotate it 90 degrees. Repeat previous step, rolling it into a 16×10 inches sheet, dusting with flour as necessary to prevent sticking, and folding it into thirds. Wrap the dough in plastic and refrigerate overnight. 1. Melt the chocolate and butter in the top of a double boiler over medium heat, stirring frequently until the chocolate flows freely. Turn the heat to low to keep warm. Mix in the sugar and cinnamon. 2. Spread the chocolate on buttered dough, then sprinkle generously and evenly with the cake crumbs. 1. Drain the fruit into a strainer and reserve the liquid. Add juice or water, if necessary, to bring the liquid to the required amount. Add the food coloring, if desired, and stir to blend. 2. Thicken the liquid: Reserve 1/4 cup of liquid and put the remaining in a saucepan. Bring to a simmer over medium heat. Add the sugar and stir until dissolved. Add the cornstarch or arrowroot, mixed with reserved liquid, and return the liquid to a simmer, stirring constantly until thickened, 2 to 3 minutes. 3. Add the fruit and stir to blend. Let cool to room temperature before spreading on layer of cookie dough and topping with cake crumbs. 1. Combine the apricots and water in a saucepan and bring to a boil. Reduce heat and simmer for 15 to 20 minutes, adding more water as necessary, until apricots have softened. 2. Transfer apricots to a blender or food processor and blend until smooth. 3. Return to saucepan, stir in sugar and return to very low heat, if necessary, to reduce the mixture to a thick paste, stirring frequently to avoid burning. 4. Let cool to room temperature before spread on cookie dough and topping with cake crumbs.